St. Cloud State University is positioned to do its part in restoring public confidence in Minnesota’s higher education institutions. Our Strategic Action Plan answers the call to become an entity more than it is today – more responsive to changes in the world, more oriented toward student success, more accountable to community partners and more engaged in the success of our state and its people. Continuing our work together, we have crafted a new iteration of our original mission that was created nearly 150 years ago – to become Minnesota’s 21st Century Engaged University. The higher-education business model is fundamentally changing across the country. In Minnesota, limited public resources and diminished public confidence in return on investment have caused a substantial reduction in funding higher education, resulting in an increased reliance on tuition to fund operations. However, as demographics shift in the Upper Midwest, recruitment and retention of traditionally aged first-year students has become more competitive and expensive. While trends in higher education endorse efforts of schools to offer innovative and dynamic options to meet the rising expectations of prospective students and stakeholders, the challenge becomes how to expediently meet these expectations with less support and fewer resources. Traditional models of delivery and historical practices are no longer sufficient to remain competitive. 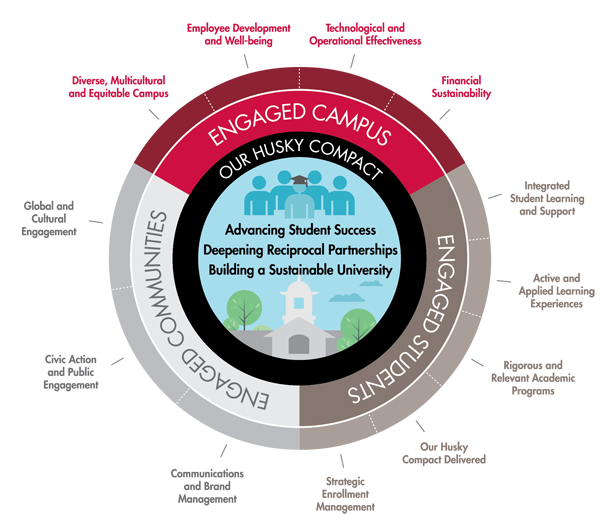 The last five years of enrollment declines and the increasing expectations of our students and communities have created a sense of urgency to sharpen our focus and reimagine how we deliver on our mission in this changing environment. To that end, our 2017-2022 Strategic Action Plan repositions St. Cloud State University within the higher education marketplace – leveraging our strengths to expand our areas of excellence, increase our competitiveness, and maximize our potential.